It has been a while since we did any workshop for the Industry. We have never promoted or targeted the industry for our workshops, but they were always welcome if they contacted us. So it was a pleasant surprise when a Manager of the Medical Information Dept of Wockhardt sent us an email in the end of July asking us for a workshop for their employees. Their initial coverage requirements prompted one of my colleagues to comment “They seem to be asking for a Diploma course in a day”! Nevertheless it was great knowing that they were so interested in having employees get trained in literature searching. 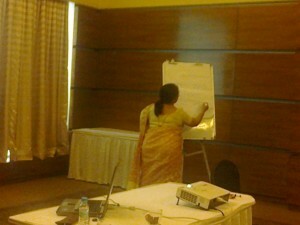 After discussions about mutual convenience, the event was fixed for August 26 at a hotel in Powai. I must compliment Mr. Motlekar who organized the whole event for taking care of every logistical detail and also for telling his colleagues all about our Foundation. The program began at 10 AM and was a whole day event. There were 13 participants. We covered certain basics of literature searching, PubMed in pretty good detail, an hour about the Cochrane Library and then discussed some of the Clinical Trial related sites. We also gave a small preview about a Reference Management Software. At the end of the day, we had some interesting discussions with several questions on the practical handling of copyright. We also discussed some of the databases / resources that Wockhardt subscribed to and helped participants put them in perspective, when searching. The sessions as usual, were a mix of some didactic teaching and practical exercises. What my colleague Lakshmi and I really appreciated was that participants seemed to put in their complete selves into solving every exercise. If they got stuck, they really tried all options before calling for help. And a very special mention that we cannot help sharing is that when we announced breaks for tea / lunch, they actually sat at their laptops for at least 5 – 10 minutes longer before going out to the lobby. That was a real committed group! At the end of the day, Mr Motlekar summarized the day’s learnings. Dr Ganesh Kadhe, AVP Medical Affairs specially mentioned that the program definitely made a difference to all of them. He had heard about us from his spouse who had attended one of my (VS) lectures and recommended our workshop. The Medical team discussed their needs and had then planned this program. Dr Kadhe felt that the junior members of their team should also go through the workshop. He felt deeply that when the organization paid for access to several databases and resources, the real return on the investment would happen only when the resources were used correctly. This is something we at QMed always say and would echo once again. At the end, we felt that we should offer workshops to the Industry too, so that their usage of information resources is lot more meaningful. When their medical teams work with their marketing and allied teams, such learning may make a lot of difference. For many doctors (especially private practitioners), it is still the Industry that is a source of medical information updates and if the updates are more evidence based, that will make a huge difference! This entry was posted in 6 - Old posts and tagged Cochrane Library, Copyright, CTRI, IIPH, Information Literacy, PubMed. Bookmark the permalink.